Rising Saga: Origins is a FREE anime style Visual Novel and JRPG hybrid with grand adventure elements reminiscent of games such as Dragon Age: Origins, Baldur's Gate, Star Wars: Knights of The Old Republic and Vampire the Masquerade: Bloodlines. Feel free to support the game and me on Patreon! The Kingdom of Midgard is recovering from a long and bloody war with the neighboring Kingdom of Antilla. A fragile peace has been achieved but tensions have risen once more. You are one of the first Vanguard-Class Adventures, elite operatives trained under the tutelage of the greatest Adventurers in Aenar. Your actions and choices will shape the world of Aenar for the better...or for the worse. Featuring the amazing music of Souichi Sakagami (AKA Trial & Error) to emphasize the anime style of the game! Be your own anime hero/heroine! Extract and run Game.exe file. So far I finished Prologue and Act 1 so I'm going to speak from my feeling towards them. (Even though I didn't finished the Demo) I like everything so far the art is good, the story is decent and easy to understand, and the world is not too small and not too big which is good by my book. The characters are diverse yet simple but not blank(Which is again, just as I like). Personally I like Sam(Male Protagonist) and Princess Lily(Poor girl), if there is going to be a option I would like Sam and Lily to be official couple (I was choosing the "nice" dialogue options, because they are good kids and the plot looks like will have them both as Main Hero and Main Heroine role)! Unfortunately they didn't even meet each other but I hope Sam can help her! The only problem I have is a act 2 beginning cutscenes and lagging in some parts of the game. But that's probably my old computer's problem. Overall good work JaBud Games! I hope I will be able to play the full version of our game one day! Good luck! Artstyle very nice. The game is overall very pretty, and I appreciate the effort put into atmospheric effects like the sun-beams, weather, and lighting. Storyline is nice so far, albeit nothing *too* original. But, originality shouldn't be placed over execution, and it's executed just fine. A surprisingly large number of events do not have "Direction Fix" enabled, so you can click on an object and depending on your direction it'll change to look like something different. Also, certain characters who only make sense to be looking in one direction still turn to face you, even though their dialogue doesn't acknowledge your presence, so I'm pretty sure they also should have "Direction Fix" enabled. A few tiles on various maps are able to be walked on, allowing minor bugs like being able to walk on tables, or get a tile or two out-of-bounds. Nothing game-breaking, however. The first appearance of Fox did feel rather... obvious, to the point where I was like "Why are they saying that name and giving that information in front of a witness? Is it just so the reader knows for sure who they are?" however as that name becomes relevant later in the story I do understand why, but it still feels contrived and stupid of Fox, and when I first read it it felt very hand-holding to the reader. The twist isn't that hard to deduce, after all. Idk, just a small thing that temporarily broke my immersion. Probably just me though. I'd complain about the encounter rate on most maps feeling a bit too small, however the ability to escape from any battle makes the frequent random encounters more of a minor gripe than an actual major irritation. Overall, quality demo. It's clear a lot of love went into this. This game is freaking beautiful! I cannot wait for Act 3 and beyond!! :D Keep up the amazing work! Hey there! This game looks so interesting! And I just wanted to ask if it'll be long before the release of Act II? I haven't played yet, but I'd rather not play the demo if it's too short. Though, if it's still a long shot before the next act, I may just play because I don't want to wait too much either haha! On a side note, I actually have another question. Who are the romance options in this game? And are they girls, boys or both? Not much info on that (or the characters at all, actually) on the game page here. Hello! ACT 2 is currently finished :) and up! It's about 3-4 hours of game play so it's less of a demo more of an early access title at the moment. Each act takes me about a month or two to complete. Ooh I see - for some reason I thought the second act wasn't finished yet. Well? I guess I'll try it soon then! Thank you for your answer! It's funny, I've been wanting to play and more or less following the updates (I'm subscribed) for some time now, but didn't even realize this game could be BL depending on your choices, even if I actually am a big BL player haha! So if I get it well, if I play as a boy, ONE character won't be an option, right? Who is it, so I don't try for nothing? It will be Icarus. There’s a storyline reason why he’s straight but it’s not present in the demo. Tyran is also complicated as far as categorizing but he’s available as a full romance path for male characters as well. Thank you for your interest! I hope you enjoy the game! There’s some bugs and grammar issues (English isn’t my first language) but I hope you find it fun! That's okay, English isn't my first language either and I'm not perfect with it, so I understand! Icarus seems sweet, but even without knowing him, I kind of thought he's the one who'd be the best suited for the straight exclusive option, so it fits my impressions. I may replay as a girl at some point if I like him enough to romance him. Anyway, thanks for your answers - if I have time, I may try this evening! I've been finally able to play the demo! Well, I haven't finished yet, but I just started on the investigation mission, and it feels like a "last quest of the arc" type of thing, so I'll share my thoughts right now even if I still have things left to do. Well, first of all, really, the game is simply amazing. I felt attached to the characters very fast, and the story is compelling, at least to me - it's exactly the type of fantasy I like, with the added freedom you have by being an indie dev. I must admit I enjoy the music a lot - I'm a sucker for in-game songs (as in, songs with actual lyrics). I'd like to go a bit more in depth about the characters and stuff, but before that I'll point out a couple of things that may be considered mistakes or simply that I would add. - There's a faint square around Erika's portrait - like a border remaining from the original file or something like that. - The game would benefit from an auto toggle for battles. It's fine at the beginning, but for people who grind a lot like me, it's nice to be able to just let the characters attack alone once you're in late game. Also, I'd really add a text log - sometimes I get a bit finger-heavy on the mouse, and since the game is set to start skipping if I let my finger down, I may miss some text. A log would allow to go back and read it. - As usual, a gallery wouldn't be bad either - it's nice to be able to look at the CGs anytime. Maybe even listen to the music. Well, now for more in depth things! If someone else than the dev reads it, BEWARE OF SPOILERS!!! I like how you have such a huge array of choices all the time. It's nice to be able to really shape the main character as you wish. The karma system is nice too. Considering the MCs demonic predicament, I can imagine how badly it may end if you have bad karma later on. I'm curious as on why the demon was divided into two parts though. Many mysteries ahead! So far, I like most of the characters. The only one I'm not so fond of is Myrana - she's really not my type, but I can tolerate her so that's okay. Icarus is very nice too, but fortunately I don't feel frustrated for not being able to romance him with a male MC - somehow, I'd rather have friendship than romance in his case. On the other hand, part of me is sad Kuro isn't an option - I adore him! Buuut... hands down, my favorite character so far has to be Tyran. My god I love him so much! He's exactly my type - personality and looks both! And now I understand why you told me he's hard to categorize haha! Well, that's fine, he's awesome as he is. I'll be definitely going for him, as far as romance goes. I actually like Killian a lot too, but he simply can't compare. And well, I like to romance only one character per playthrough, even if the game allows me to pursue various characters, so yeah - Tyran it is. This makes me slighly curious about how the bathhouse scene unfolds if you play as a girl, but that too, was fine the way it was. Man I love this game and this character haha! With that being said, I have a couple of questions too! - How many acts total will the game have? - And how many endings too? Are they per character, or are the character specific endings more like added to a global ending depending on how you played? Or is it something else entirely? Also, aside from bad ending/s at the end, are you planning some sudden game-overs caused by bad choices? Sorry, I'm always very curious about ending technicalities! - Is it possible to get a good ending for the main story of the game but fail the romance I was trying to achieve? - Will the saves I make still work in future updates? I don't mind replaying every single time, but depending on the answer I will grind more or less! 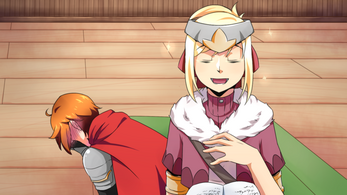 - Are the character portraits in the text box original art, or edited RPG Maker assets? The style seems like it would be the later, but I don't really recognize the specific pictures. - And last one... Well, it's about Tyran again, and it's the most spoilery question I suppose, but so far the game didn't make it really clear and well, I guess I'd like to have a confirmation one way or another. I've been referring to him as a "he" and well, the game does so too. As far as I'm concerned, he's simply a trans boy, so that's it. But it may actually be the other way around - a "crossdressing" girl. By instinct, I'm inclined to pick the former option, but I'm not sure either, so yeah... basically how does he feel about himself in that aspect... Is it something you can tell me? Well, I think that'll be it. Sorry for such a long post and for the amount of questions and stuff. If you'd rather not answer some of the things I asked, I'll understand, so don't worry about telling me... well, that you can't tell me! I'll finish playing after some sleep and work! First off, Thanks for playing the demo! As far as your save file working for the next update, it should! but i'm changing Emily drastically and adding some additional stuff to the game like 10 new perks as well as restructured dialogue and more CG art for scenes! I definitely recommend trying it out from the beginning once the next update gets released. I've also personalized the UI! Hooray! I apologize in advanced for the lengthy reply! I shall now try to answer all your questions! Good catch! Thank you for that! For the gallery and the music stuff, it shall be implemented by next update! ^_^ thank you for suggesting. I've been meaning on working on that but I've just been too focused on the main plot line. I have also tried implementing an Auto Battle system however it really messes with Kuro's reload system hence why I opted not to use it. (He keeps reloading instead of attacking T_T) Thank you for letting me know it's your desire as I believe I should find a work around on this feature instead of dumping it completely. Text log might also be a bit of a work as the game engine functions as individual text boxes but I will see about this feature! How many acts total will the game have? There will be 6 acts as well as epilogue that varies differently based on player choices. I want the ending to be like a culmination of all the different choices you have done throughout the game as well as the relationships you've built. 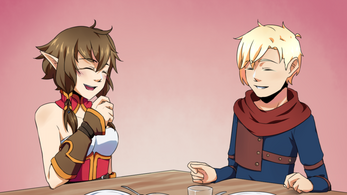 Unfortunately, I'm also planning on doing a singular romance option at a certain point so while you may build up romance stuff with everybody simultaneously, I do want a character specific romance ending with variations depending on the choices. *choices and consequence is a big theme in this game and it's making my life as a solo indie dev hell but it's worth it thanks to wholesome feedback from people like you! 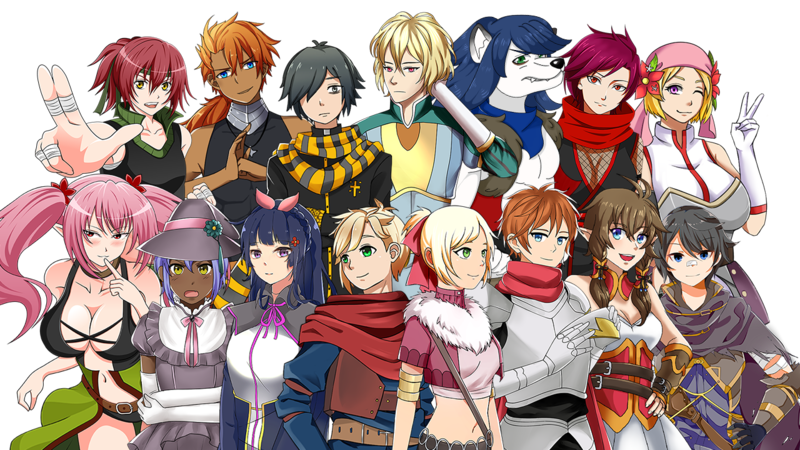 - Are the character portraits in the text box original art, or edited RPG Maker assets? There are some original art I've collected through browsing the internet, Stella's faceset for example is actually the default cover girl of RPGMaker VX Ace! 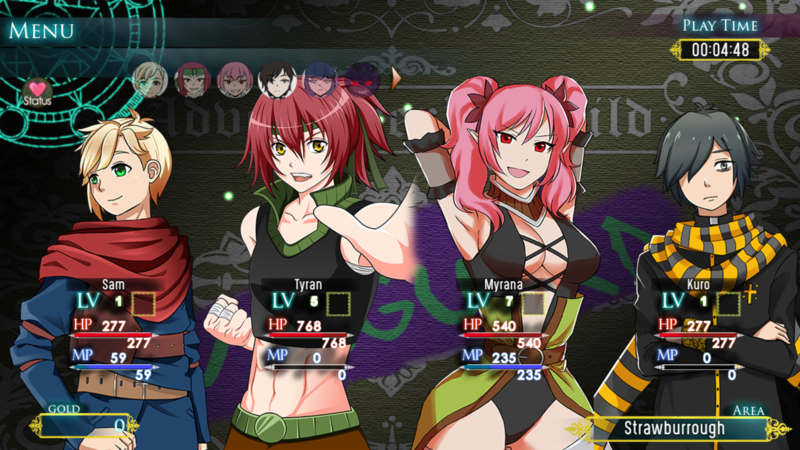 Icarus's Faceset is also the default hero for RPGMaker MV. They're edited but the busts I have are all commissioned work. 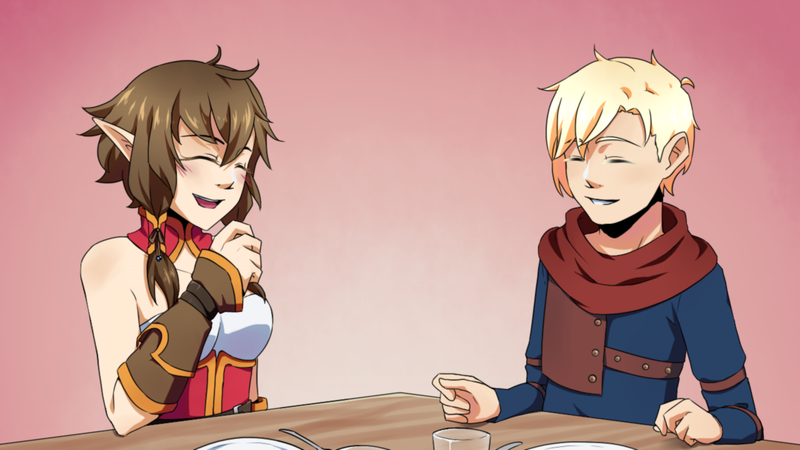 Once I am finished with the project, I will be contacting all the artists that worked on my game and see if they'd be willing to have other people use the busts in their RPGMaker projects too! Maybe you'll see Kuro's bust in a different game by a different dev one day so keep an eye out! A goal of mine is to create a game where the endings aren't necessarily good ending or bad ending but rather subjective to what the player perceives as good. In other words, a good ending for you might be a terrible ending for someone else! :D hopefully that makes sense x( There will also be a secret ending which is more or less lighthearted. For the romance stuff, There's multiple ways a romance can go but ultimately, it will always succeed as long as you keep at it. I do have to point out like i previously stated; late in the game, you'll be forced to commit to one partner just for ending reasons. You'd still be able to fully enjoy a big chuck of everyone else's romance paths however. I've been referring to him as a "he" and well, the game does so too. As far as I'm concerned, he's simply a trans boy, so that's it. As far as him being treated as trans, yes, he is a full FtM but the constraints of the setting prohibit him from actually getting therapy and surgery and stuff. A big chunk of act 3 actually revolves around him so yay! stay tuned! Thank you so much for playing the demo! I'm glad you enjoyed! The demo ends after the 1st romance scenes and you get a glimpse of the beginning of Act 3! Ever since the submission for the Game Making of 2018, I've been playing each demo version, and up until now this it's getting better and better. thank you! <3 i appreciate the support soo much! And for the Karma how we can see it? But it's because this is not finished isn't it ? Very good game, I loved playing this alpha. Did you think to add one page in the statut to see the perk and their information? ACT 1 IS UP FOLKS! There’s content between that time skip that’s focused on just bonding with your classmates which is totally skippable I just didn’t include it because I had to refocus my efforts on fixing a bug and I just didn’t have time :) the game def will be improved upon by next spring so stay tuned! Thanks for the love! Hope everything goes well for you from here on out. Best of luck for your Game.